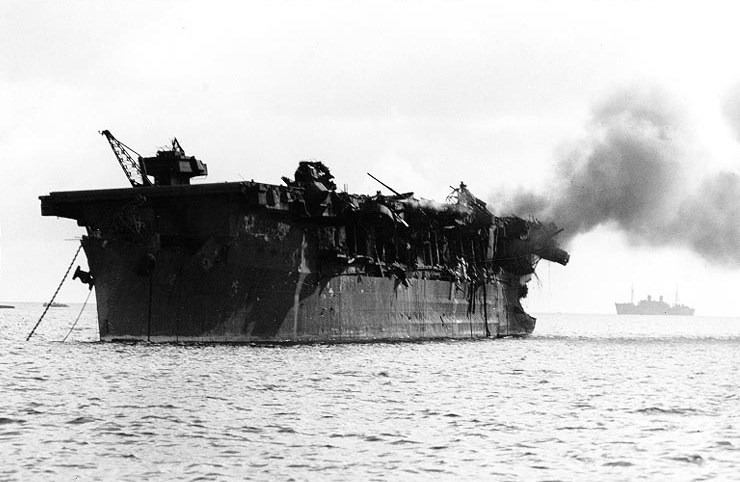 Underwater archaeologists have determined the role USS Independence played after World War II. They used declassified government documents and sonar images of the shipwrecked vessel to unlock the secret. The Independence (CVL 22) was one of 90 ships assigned to Operation Crossroads, the atomic bomb tests conducted at Bikini Atoll in the Marshall Islands. It was scuttled in 1951. Little was known about its use after the tests. The location of the shipwreck was found last year and researchers began comparing sonar images of the wreck with the declassified documents to determine the vessel had been used as a radiological laboratory and nuclear waste receptacle from 1946 to 1950. “Now we not only know what shape she’s in and where she lies but also exactly what happened to the Independence,” said lead researcher James Delgado, a maritime archaeologist at the National Oceanic and Atmospheric Administration (NOAA). One of the first vessels to be converted to a light aircraft carrier following the attack on Pearl Harbor, the Independence operated in the central and western Pacific from November 1943 through to August 1945. After the war, it was assigned to Operation Crossroads as part of a fleet positioned within about 1700 feet of the “ground zero” blast from the bomb tests carried out to examine the effects of shock waves, heat, and radiation. Twenty-one ships sunk during the tests, but the Independence survived, although it was heavily damaged when it returned to the U.S. The government decided to use the Independence as the Naval Radiological Defense Laboratory and hauled more contaminated materials onboard to be studied. The lab was the first training and teaching platform for dealing with waste from the aftermath of an atomic explosion. Radiation levels were monitored constantly. In 1949, four boilers, condenser units, and steam turbines were removed to make room for more waste. Sinking the Independence served multiple purposes for the Navy. It was too old and too vulnerable to potential espionage to be of any use. Once it was decided to sink the ship, additional waste was brought onboard because of a lack of adequate storage facilities. “Independence, by the time it was sunk, was at about a level that you would get with an average X-ray,” Delgado said. Anything that might potentially be an issue was enclosed in steel and concrete drums deep inside the ship, he explained, and seeing that the wreck was still intact underwater was reassuring, although the researchers would like to continue monitoring Independence because of its radiation legacy. “This remains one of the most compelling frontiers in science, given not only the size of the oceans but what rests within them,” Delgado said.